Summary The town hall Ludesch is a good example of sustainable, ecological and energy efficient architecture. It features a net use area of 3100 m². The building had been designed to reach passive house standards. Main construction material is wood from regional forests. 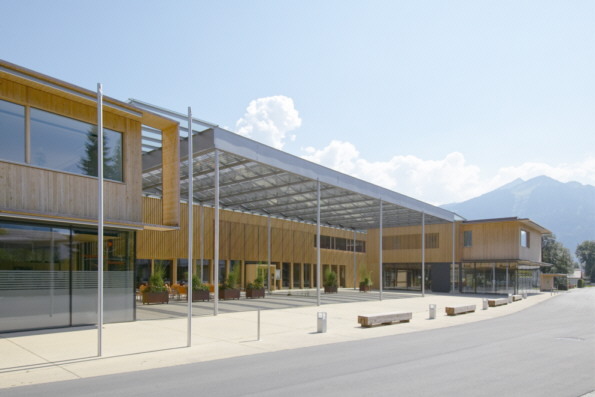 All material was selected according to a regional standard for ecological and sustainable buildings (Ökoleitfaden Bau by Umweltverband Vorarlberg, issued in year 2000 -www.umweltverband.at). Three building parts open up a yard, which is protected by a roof from semitransparent PV modules. The 350 square meters PV roof above the new village square has several functions: It produce 16.000 kilowatt hour per annum, enough electricity for five average households. furthermore, the PV roof protects the square against rain, as well as the offices in the top floor against the sun.